A vain assassin takes an assignment with dire consequences. An aristocratic lady fleeing her past is besieged by pirates. And a manticore princess sets out on a life-changing adventure . . . 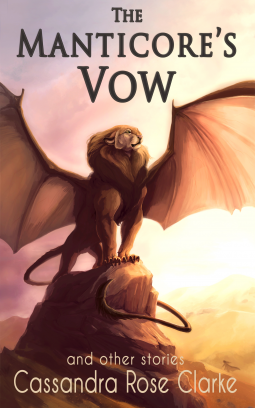 The Manticore’s Vow collects three stories set in the world of Magic of Blood and Sea by Cassandra Rose Clarke, all exploring the origins of some of its most memorable characters: Naji, the scarred assassin, Marjani, the pirate queen, and Ongraygeeomryn, the man-eating manticore. Explore a world of dangerous magic and thrilling adventures with this trio of gorgeous, swashbuckling tales. Available for pre-order via all retailers starting April 30! If you are interested in receiving a physical ARC, scheduling an interview with the author, or have other inquiries, please email us at contact@interstellarflightpress.com. This is a fantasy and adventure book so I would strongly recommend this to readers who like those genres because this read represents the best of them! It's got worldbuilding that is out of this world with obstacles and that a charismatic protagonist prevails over. It's a unique premise that is executed amazingly well because the author has a whimsical style of writing that captures both prose and action scenes. The thrilling action sequences are combined with characters that you can't help but root for to prevail. It's exciting and original, with fantasy and adventure, this read will keep your eyes glued to the page. Thank you to NetGalley, the author, and the publisher for an ARC in exchange for an honest review.